For one, I’m sure though it’s not what we American’s think of as “traditional” there must be some turkeys in Japan, but what really cemented this turkey and ramen marriage was this recipe from Chef Edward Lee of 610 Magnolia. Chef Lee is known for blending Asian and Southern flavors in a way that celebrates both cultures. I’ll be watching for more recipes from this Chef in the future. Because the Turkey Ramen (or any Ramen) is started with a long cooking stock or bone broth as it’s sometimes called, the Turkey Ramen is incredibly silky, luscious and rich and because that stock is fortified with classic Asian flavors (or in this case, classic Asian and a bit of American tossed in) it’s not just rich but aromatic. The idea might be a fresh & fun Turkey Ramen but this is serious Ramen underneath it all. And while the Turkey Ramen Broth is the essence of the Ramen, it’s the garnishes make it so much fun. I listed about a dozen to pick and choose from, so add what you like from the list, and if your favorite Ramen garnishes aren’t included feel free to add your own. We all love picking and choosing from the garnishes! That’s the best part. Any extra garnishes get tossed into the next evening’s salad. This Turkey Ramen is started with my homemade Turkey Broth (or Chicken Broth) so it’s very quick to throw together the Ramen. That long-simmered broth takes a long time to make, but a store-bought turkey or chicken stock can be subbed in. The store bought stock won’t have quite the same deep, rich flavor and body but simmering in the Asian ingredients does wonders for the flavor. 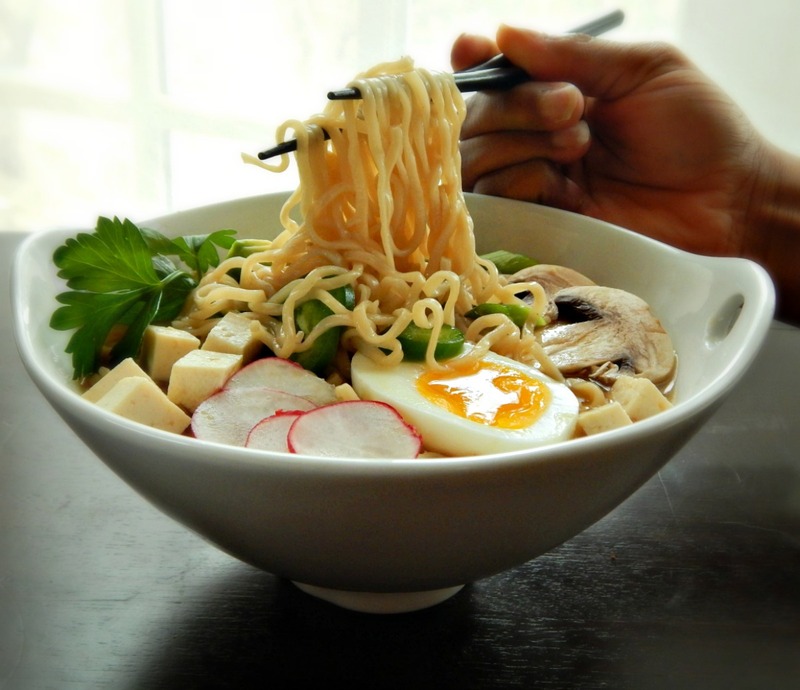 Homemade Turkey Ramen – delish! I didn’t do much changing to the recipe but I did manage the recipe as I do with most of the soups made from Chicken or Turkey Broth. I make up my usual big pot of rich turkey stock and then divvy it up for a couple of different recipes. So that means I just took the few cups (8 cups) of stock and then simmered that portion with the Asian spices. You can do the same with homemade or storebought stock if you don’t just happen to have a turkey carcass laying around. Because I started with the Homemade Turkey Stock, some of the ingredients from Chef Lee’s recipe aren’t added since they were already used in that initial stock. Bonus, huh, for a little quicker and a little easier. I just used the basic package of grocery store ramen but you can use any ramen noodle you want in your Turkey Ramen, just cook according to package directions. Chef Lee said you can even use a thin spaghetti. And while I did make my Turkey Ramen with tofu, too, I think it was actually overkill, since the ramen already has turkey in it. As for the Miso, use white or red, both are delish. Miso is fermented and keeps forever in the fridge. Months, possibly years, so don’t be afraid to buy a bottle. I use it in a few recipes so just follow the tags on the bottom of the page or use the search box on the sidebar. I didn’t sweat the daikon, either, and tossed in some radishes from my Thanksgiving relish tray instead. The most savings on this recipe is using your homemade Turkey Stock and that’s where the best taste is. I love when when cheap and fabulous intersect! I gave options to get the smoky, porky flavor into your Ramen stock, and bacon is the cheapest. If you can’t find country ham, use a bit of regular old ham. Watch for your Asian ingredients, often unadvertised, during the Lunar New Year (it changes every year, just look it up) or shop in an Asian market; you’ll be surprised at the price differences. The garnishes are up to you. If your making it after a holiday, rob your relish tray! The plain old mushrooms are generally less expensive than shitakes or any Asian mushroom you might find. The spaghetti will generally be less than the Ramen and parsley (grow your own) more widely available and less spendy than watercress. You might like cilantro instead. Add all ingredients to a large saucepan, bring to a boil, reduce to a simmer and simmer for about 20 to 30 minutes. Strain and place the stock back in the pan. If you’ve used ham or prosciutto, you can chop and add back to the stock. The bacon is not so attractive and is best not added back in. Add all ingredients but the noodles to the stock, bring to a boil. Add noodles and simmer 3 to 4 minutes until tender. Divide noodles and broth between four bowls. Add garnishes as desired and serve. Bring enough water to cover eggs by about two inches in a medium-sized saucepan to a boil. Add eggs and immediately lower to a simmer. Cook for the length of time desired, below. For eggs that are creamy with just a little liquidy yolk in the center, 7 minutes. For runny eggs, 6 to 6 1/2 minutes. Remove eggs and immediately plunge into a generous bowl of ice water. Leave for three minutes then peel and slice in half. Today I’ll be sharing this recipe at our very own Throwback Thursday Link Party. You might want to bookmark this special two-week extravaganza – they’re all lots of links to both Thanksgiving & Thanksgiving leftovers, Thanksgiving Crafts & Holiday Decorating. I’ll also be sharing at Fiesta Friday, hosted this week by Julianna @ Foodie On Board and Hilda @ Along The Grapevine, and Saucy Saturdays. Saucy Saturdays are hosted by four incredible bloggers: Dina, Jennifer, Christine & Swayum. This entry was posted in Click here for Bargain Meals, Click here for Fabulous Food Posts and tagged 610 magnolia, Asian, Avocado, Bargain Meal of the Week, Bon Appetit, chef edward lee, daikon, Eggs, Hot Peppers, Jalapeno, Japanese, leftover Chicken, leftover turkey, Leftovers, Lime, miso paste, mushrooms, noodles, radish, ramen, Soup, spaghetti, Tofu, Turkey. Bookmark the permalink. Hi, it looks so unique and interesting! I kind of run in spurts, I guess! Sometimes I make recipes that aren’t so good, then I have nothing to post, or other times the meal is good but the pic doesn’t turn, then I don’t post, but sometimes I get so excited when a recipe is good AND the photo is ok, I can’t wait to post it. I have trouble with impulse control, lol!! Great way to use up leftovers, especially with the cold weather. It did really hit the spot, and there’s something about slurping noodle soup!! Aw, thanks! That is so funny about your Mother in law! She didn’t go get it on the way out, did she? I will have to look up Chinese porridge! That’s so sweet – of both of you! 🙂 My sister told me, somewhat defiantly, as if she thought I’d critisize her, that she threw out the turkey carcass, lol! 🙂 Thanks! It hit the spot in that not normal thanksgiving leftover way!! I love that perfectly soft boiled egg. I have ~18 cups of lovely turkey stock (and about 2 cups of picked meat) cooling in my fridge before I put it in the freezer from my October turkey. Finally got around to making the. So many possibilities ahead. I[m done with all ours! And I want another turkey!! I never could soft boil an egg until I started making ramen!! I’m going to have to take a look at your soft boiled egg technique. Lol, it must be crowded up there in your head!! I don’t know where I’ll be for Christmas or what I’ll make! Don’t even want to think about it yet,lol! lol! I feel like I don’t even recover from Thanksgiving b/4 Christmas is here! Did you get the bacon sourdough done? You’ve inspired me to start some when I get back to South Dakota! Ok found it! Amazing looking! I love this. I also make bone broth from the carcass and it’s always so delicious. LOVE your ramen dish and who cares if it’s not traditional, I love the garnishes it looks fantastic. I can just imagine how wonderful your Thanksgiving feast was. Hey, Suzanne – it was fun, but small! Just my son, his girlfriend & myself – but they came over to stay for a few days, since I’m home. Luckily they’re big eaters!! Small is good I think I had 8 people over, always make way too much food i pretty much make the same amount of food irregardless of the number of people the leftovers are great and i send people with a container of food. Your ramen looks so good. Yeah, me too! A huge turkey and I had to fight for leftovers!! And my son’s g/f is five foot one! I have no leftovers I managed to pick the bones for Percy and my friends dog. I had one day with a little. Even cranberry sauce is gone.